A drink-driver who fled the scene of a crash revealed to a court that he was left “petrified” of being sent to prison. Chesterfield magistrates’ court heard on Tuesday, January 24, how Dale Williams, 29, of Bradwell Grove, Danesmoor, was involved in a collision in his Vauxhall Corsa after he had been driving on Pilsley Road, at Danesmoor. Prosecuting solicitor Angela Hadfield said that despite fleeing the scene Williams was caught and found by police to be nearly four times the legal drink-drive limit. Mrs Hadfield said: “Officers received a report of a road traffic collision involving a Vauxhall Corsa. Witnesses spoke to the driver before seeing him make off from the scene. Williams gave a reading of 132 microgrammes of alcohol in 100 millilitres of breath when the legal limit is 35 microgrammes. 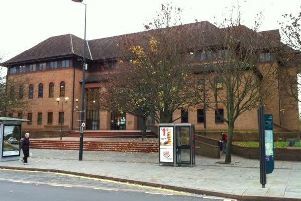 The defendant pleaded guilty to exceeding the alcohol drink-drive limit after the incident on January 7. The probation service stated that Williams had driven to a pub to watch football with friends and he had drunk ten pints of beer and had originally intended to walk home. Williams was also found to have cocaine with him at the time of the drink-drive offence, according to the probation service, but he only received a caution for this offence. The court heard that Williams was left “petrified”, according to the probation service, at the prospect of custody which could have led to him losing his job and house. Ms Simpson added that Williams was very upset and ashamed of driving in a manner that had caused an accident. Magistrates told Williams he had crossed the custody threshold because he could have killed someone or himself with such a high alcohol reading. However, due to Williams being of previous good character they felt a suspended prison sentence could be imposed instead of putting him behind bars. Williams was sentenced to 12 weeks of custody suspended for 12 months but was warned this could be activated if he re-offends. He was also given 120 hours of unpaid work and must pay £85 costs and a £115 victim surcharge. Williams was also banned from driving for 32 months but this ban could be reduced by eight months if the defendant completes a drink-drive rehabilitation course.